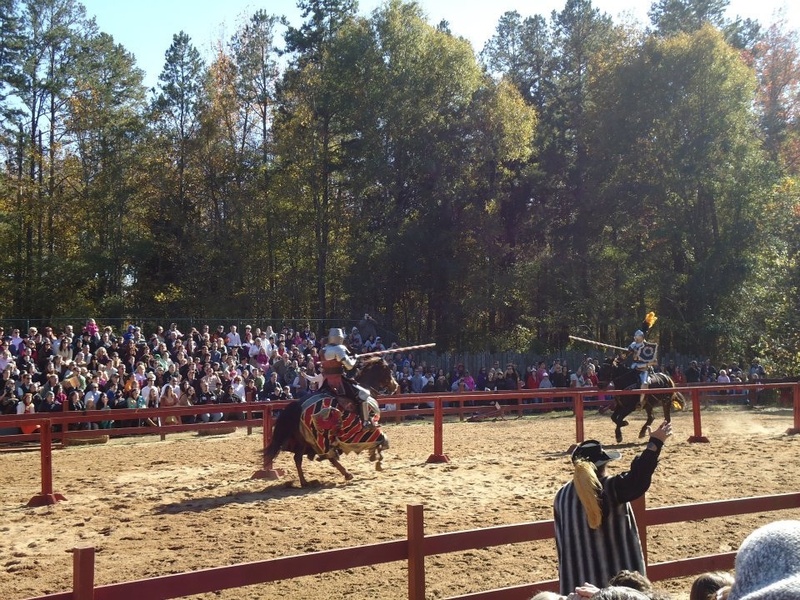 Two knights compete in a jousting tournament at the Annual Carolina Renaissance Festival. Radford University’s English Club attended the Annual Carolina Renaissance Festival Saturday, Nov. 5, in Huntersville, NC. The club has used this opportunity each year to experience 16th century European style art and entertainment. The festival takes place all over the country, falling on weekends through the months of August to December, depending on location. Beginning in 1994, with six acres of exhibits, the Carolina Renaissance Festival has grown to become one of the largest Renaissance fairs nationwide. The outdoor festival contains over 100 locations of crafts and food, with ongoing live music and shows. Music includes everything from harp soloists to Celtic groups, and acts varying from comedic plays to live falconry presentations. With over 500 people hired to dress and speak in character, visitors are encouraged to come dressed to fit the time period, however, anything goes. Visitor costumes range from Renaissance kings and queens, to wenches, fairies, dragons, and pirates. Weekends may include special event themes such as Celtic, pirate, Oktoberfest or deaf awareness. The festival provides entertainment for all types of people; some of those who come to enjoy the entertainment, and some who have a passion for the time period. Weddings are not uncommon to see at the festival, and the English Club was able to have the opportunity to witness one. Although outside, open front shops are built for craft and food venders that stay stationary all year round. Two of the most notable features of the festival are the giant turkey legs and the jousting arena. Three times throughout the day actors put on live action jousts involving audience members to act as peasants, cheering for a knight depending on what side of the arena they have chosen to sit. The King of the festival oversees the joust, rating knights on their skill of efficiency, horsemanship and fighting ability. Turkey legs are just one of the many choices the festival provides outside of an ordinary meal: fried macaroni and cheese, steak on a stake, and honey-mead, just to name a few. The club is looking forward to attending next year, and hopes to vastly grow in their number of attendees.